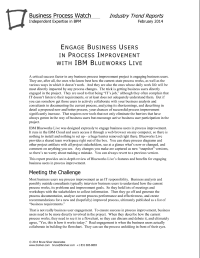 Download this report to learn how IBM’s cloud-hosted software has team collaboration built in; easily introduces users to today’s diagramming standard – Business Process Modeling Notation (BPMN) including the ability to toggle between flat and hierarchical views; has built-in and custom properties to allow you to track process data and business decisions; and works on PCs or Macs, including iOS devices. If you are engaging in a business process improvement project, you know that ensuring business users are engaged in the process is critical to your success. Tools exist on the market today that business analysts and business users alike can use to share and collaborate on documents, but few are as user friendly and simple to implement as IBM Blueworks Live.